The final two candidates in the 25th Ward aldermanic runoff election — Alex Acevedo and Byron Sigcho-Lopez — both pledge to support a continuous Chicago River Trail. While they both support the trail, they also say their support is contingent on policies being in place that prevent displacement and ensure that transportation improvements are shared equitably. The 25th Ward, located on Chicago’s Lower West Side, includes parts of Pilsen, Chinatown, the West Loop and the South Loop. The seat is currently held by Ald. Danny Solis. 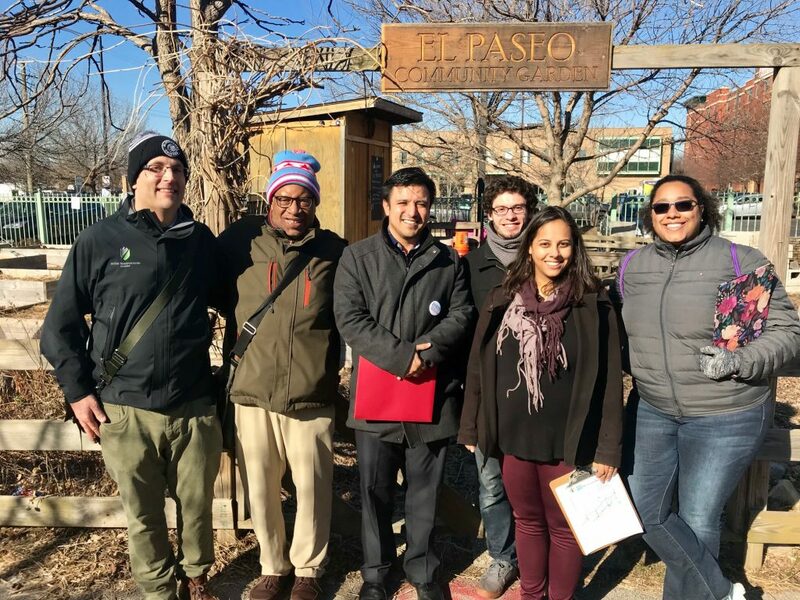 Recently, Active Trans and our partners walked a stretch of El Paseo (pictured left) with each candidate in order to discuss more details about how we can make the trail a reality in the 25th Ward. El Paseo is a proposed four-mile path in Pilsen and Little Village. 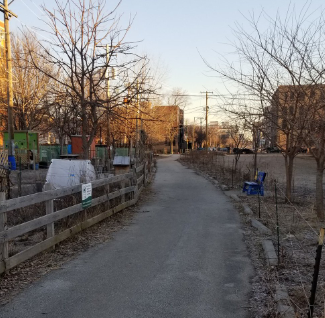 Along with enabling more local residents to walk and bike safely, the path will create safe connections to prime neighborhood destinations such as El Paseo Community Garden and the Pilsen YMCA. Active Trans staff and local partners met with 25th Ward Aldermanic candidate, Byron Sigcho-Lopez, pictured third from left. The walk with the candidates afforded the opportunity to discuss with them the current status of El Paseo and its importance to a continuous river trail. We also talked about plans to organize an El Paseo Community Council, which will ensure residents and stakeholders have a voice in the development and stewardship of El Paseo. The 25th Ward includes one of the largest remaining areas that needs to be connected via trail to complete a river trail. This area is five miles along the South Branch from Ping Tom Park southwest to Western Avenue. In addition to our conversations, we’ve also provided some written recommendations to the 25th Ward candidates. The recommendations highlight the efforts mentioned above and urge the candidates to work with neighborhood stakeholders and city departments to develop a project plan and timeline for El Paseo. 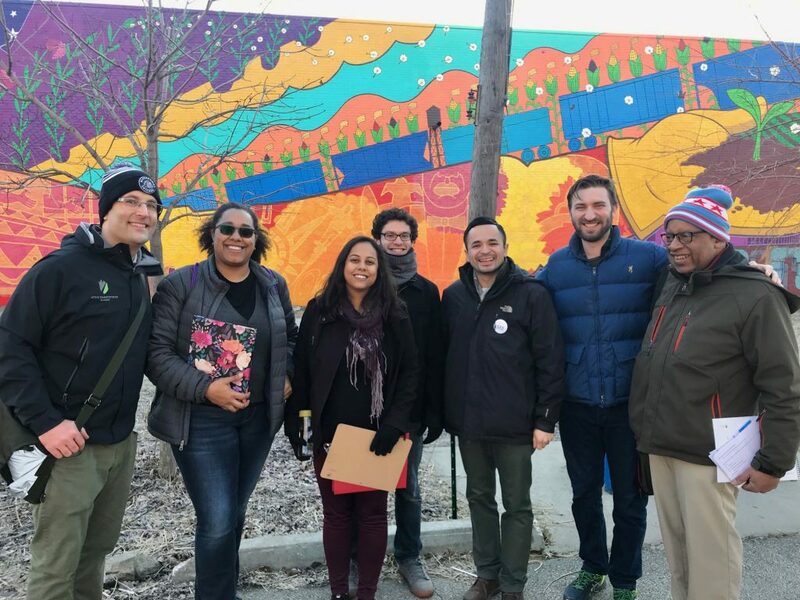 Active Trans staff and local partners met with 25th Ward Aldermanic candidate, Alex Acevedo, pictured third from right. Advancing El Paseo is a top priority of Active Trans’ Chicago River Trail campaign. A complete trail would promote walking and biking and support healthy communities, cleaner environments and a vibrant local economy. Following the April 2 runoff election, we’ll engage aldermen in riverfront wards and ask them to sign on to a letter to the new mayor calling for the city to develop a comprehensive plan for a continuous river trail. If you haven’t already, please join our campaign for a continuous Chicago River Trail.